Manipulating files and folders in Windows is pretty much the same now as it always has been. For instance, creating a folder in Windows Explorer is a rather simple process and you just right click and select New > Folder or press the shortcut combination of Ctrl+Shift+N. While this is an easy thing to do it becomes troublesome and time consuming if you want to create multiple folders at once. File organization on your drives is important and helps you locate and search for files faster and more efficiently. A big part of that is having a good and well defined folder structure on the system. If you want to create just a few folders it’s not a major problem. However, creating many folders quickly in one go is something Windows Explorer can’t do so another method is needed. There are different ways to achieve this goal so we provide you with a selection of different methods for batch creating multiple folders on your system. 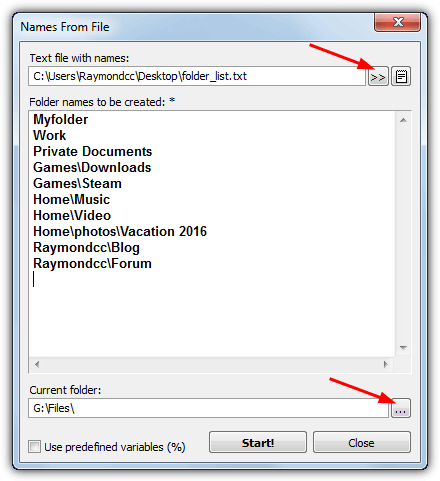 A simple and effective method to batch create folders is using a program to do it for you. 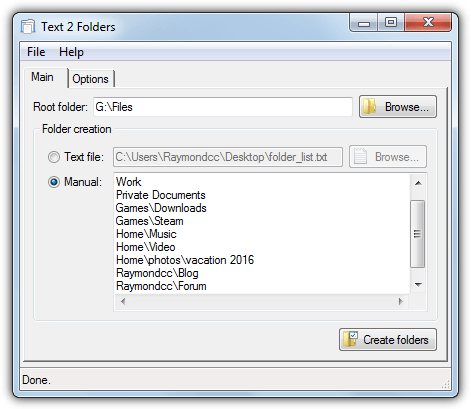 Text 2 Folders is a pretty simple and portable multi folder creation tool programmed in the AutoHotkey scripting language. While it’s not loaded with features Text 2 Folders is easy to use and has enough functionality for most users. Text 2 Folders has two modes of operation. One is loading a text file that contains a list of folders and subfolders. The other is a manual option that allows you to type in the folder names yourself or paste them in from another program. Click the Browse button to browse for the working folder where all the listed folders will be created. Add your list of names and finally hit Create folders. In the Options window you can add a shortcut to the Windows Send to context menu which opens the selected folder as the root location for new folders. The good thing about XMD is it can create lots of new folders in different ways. That includes naming by time, day, week, month, year or from text in the clipboard. It also has three different options to create multiple folders at once. XMD is a portable standalone executable. The first option is selecting the working folder with the browse button and then typing in the folders and subfolders to create separated by a vertical line or pipe (Shift+\). The second way is loading a list of names from a text file or typing/pasting the names into the window. 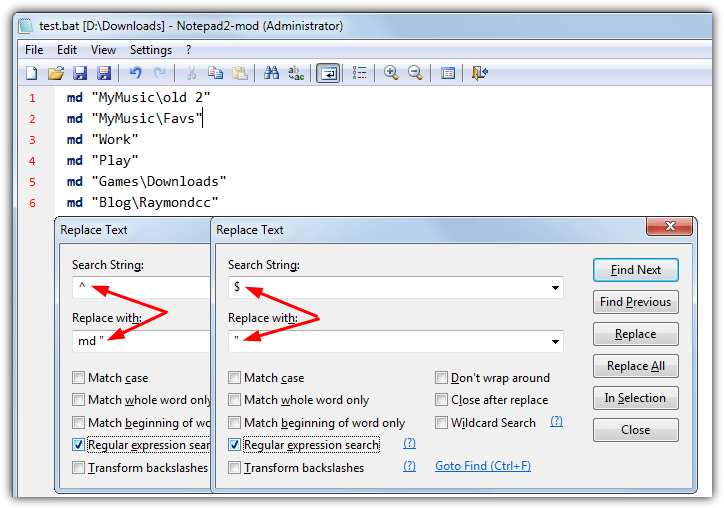 Click Options > Load Names From File and browse for the text file or paste the names into the window. Browse for the working folder and press the Start button. If you want to add some of the predefined time and date variables check the box at the bottom. 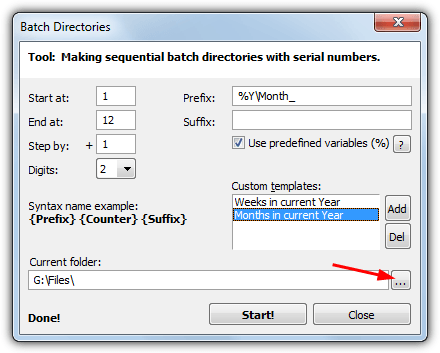 The third option creates sequentially numbered folders from the Options > Batch Directories window. After selecting the working folder, configure the start and end numbers and the step. Then enter any prefix text (before the numbers), suffix text (after the numbers) and optional built in time or date variables. It’s also possible to add custom templates for future use. XMD has pretty much everything most users might want for creating multiple folders at once while still being easy to use. There’s loads of free third party file management tools around that are more advanced than Windows Explorer. 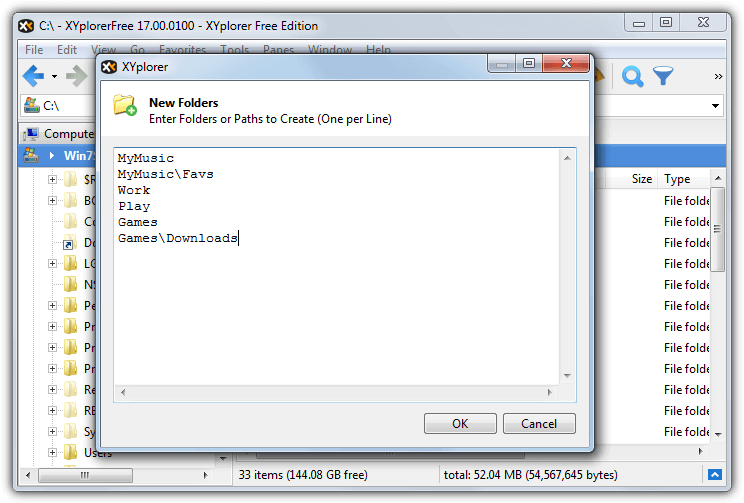 Some file managers have the ability to also create several folders at once, including FreeCommander XE and XYplorer. Creating multiple folders in FreeCommander XE is quite easy. Navigate to the root folder you want to start in then press F7 (or right click > New > Folder). In the new folder dialog enter all the folder names separating each with a vertical line (Shift+\). 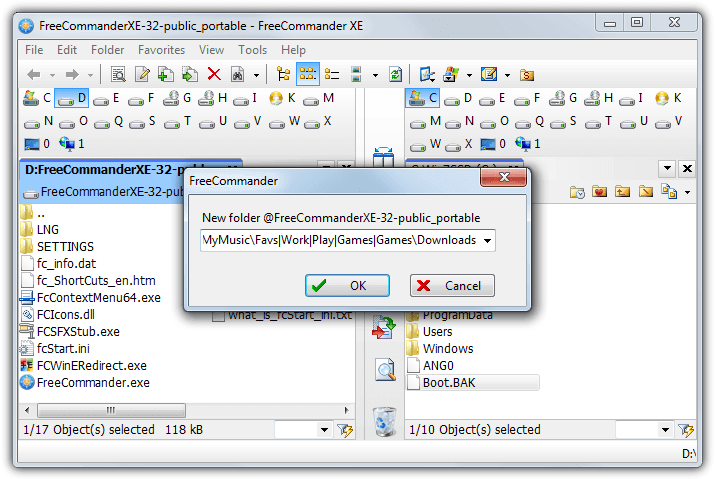 FreeCommander XE has both portable and installer versions although the 64-bit version is for donators only. Do note that the XE version has this ability but not the older FreeCommander 2009. XYplorer is more advanced at creating multiple folders than FreeCommander and is easier to use when you want to create a lot of new folders at once. 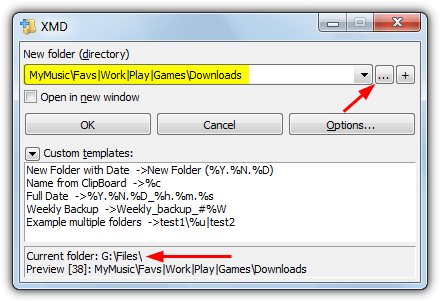 Go to the root folder where you want to start the folder creation and right click > New > New Folders. This opens up a window where you enter each folder with optional subfolder on each new line. The advantage with XYplorer over similar free file managers is you can copy and paste whole folder lists into the window from text files or other applications. Multi Commander is another free program that can batch create new folders although it requires a semicolon (;) instead of a vertical line to separate names. Other free software like Q-Dir and NexusFile doesn’t appear to have the create multiple folders ability. Using a combination of Microsoft Excel and the Visual Basic for Applications (VBA) scripting language it’s a relatively simple task to take a list of folder names and create them in one move. All you need is Excel itself and the VBA macro script. 1. 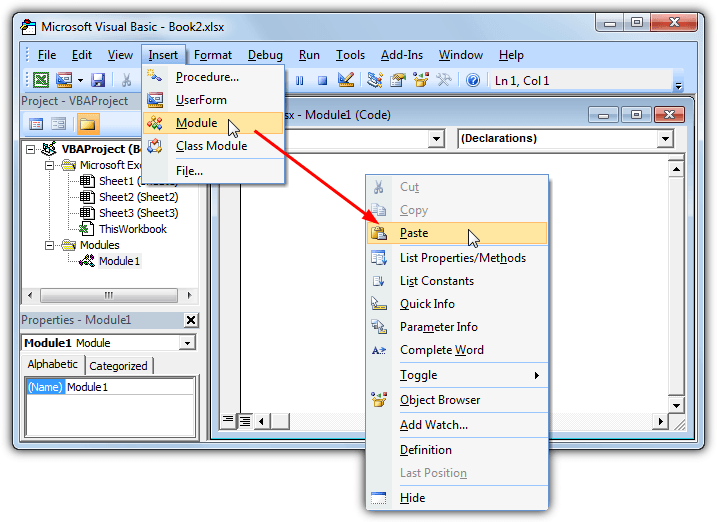 Download the VBA macro text file, open it in Notepad and copy the contents. 2. Launch Excel and load the workbook with the list of folder names. Press Alt+F11 to open the Visual Basic Editor. 3. Go to the Insert menu > Module. Right click in the new module window that’s opened up and paste in the VBA macro text. Close the Visual Basic Editor. 4. To launch a macro press Alt+F8 or go to the View tab > Macros. There are two macro scripts available. Select which one you want to use and press Run. 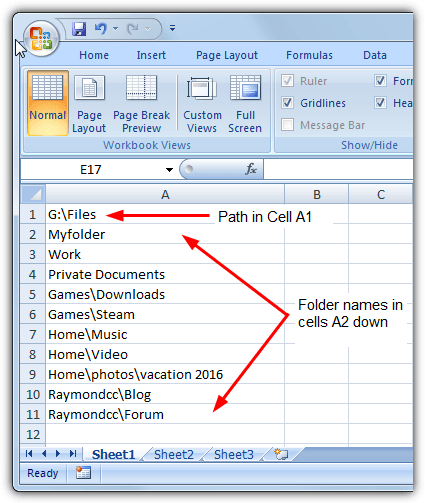 The CreateDirs macro will read the root path to create the folders in cell A1 and then create the folders found in cells A2 onwards. For example cell A2 below will be created as G:\Files\Myfolder and etc. Make sure to insert the path to create the folders into cell A1 or they will not be created in the correct location. 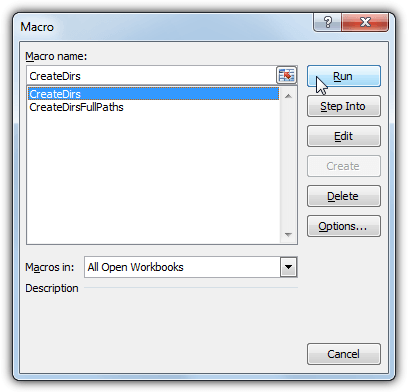 The CreateDirsFullPaths macro takes a list of folder names with each having its own full path. 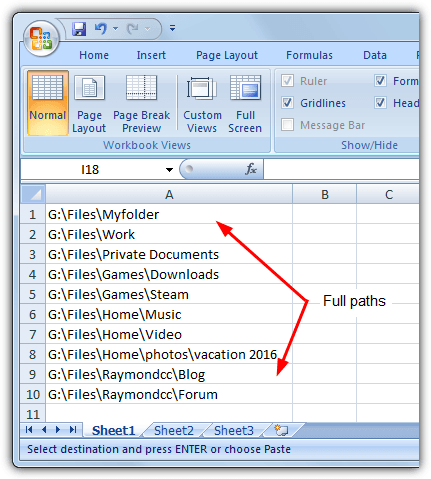 Cells A1 to A1000 will create a folder name with the exact path specified. 5. To keep the workbook and the macro for future use save it as an “Excel Macro-Enabled workbook (*.XLSM)”. Depending on your Excel security settings you might have to accept a security warning to enable the macro when reloading the workbook. If you need more than 1000 folders or to a specify a different range the VBA script can easily be edited to accommodate. You can also configure a keyboard shortcut in Macros > Options so the folders can be created by simply pressing a key combination such as Ctrl+C. Using a simple batch script to create a number of folders is very easy and doesn’t require special knowledge or external tools. All you have to do is create a text file with a list of all the folders and relative paths with the command MD at the start of each line. MD is the same as the mkdir command line tool and is used in the background of some third party folder creation tools. Create an empty text file and simply add “MD ” then the relative path of each folder on a line. Save as a .BAT batch file and copy it to the root folder where the new folders are to be created, then run it. The full path to each folder can be used so the batch file can be run from any location. For example “md D:\MyFiles\Work” or “md G:\Docs\Blog\Raymondcc”. Alternatively, insert a new line at the beginning of the batch and CD to the root folder, e.g. “cd D:\MyFiles”. If you already have a list of folders in a text file, it’s possible to add the md command to each line automatically turning it into a batch file. You will need a text editor which has a replace option that accepts regular expressions. Windows Notepad hasn’t but others like Notepad++ and Notepad2 have. We’ll use Notepad2 Mod. Load the text file into the editor and go to Edit > Replace. 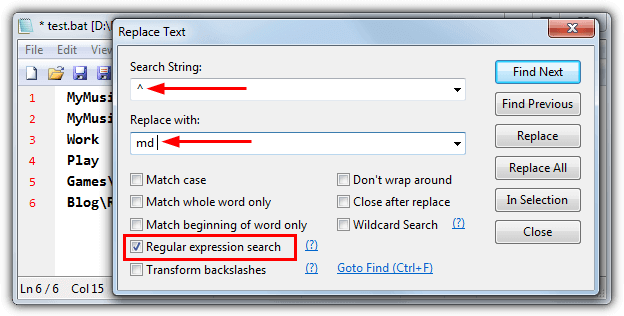 Select the Regular expression search check box and for the search string enter ^ (Shift+6). For the replace with string enter “md ” without quotes. Press Replace All and md will be inserted at the start of every line. Save the file as a .BAT and run it. Tip: Don’t forget that folders with a space in the name have to be enclosed in quotes. Failure to do that will give you separate folders named after each word. If you have some spaced names in your text file and they aren’t quoted the safest option is adding quotes to all folder names in the list. To do that use the same replace window but add a quote to the md replace with (md “). Then perform a new replace using $ as the search string and a single quote (“) as the replace with. Make sure the regular expression option is enabled before you run the replace. Great program. Easy to use and portable. Thank you for this gem. I so could have done with this a couple of years ago when sorting my own music out. Different ripper programs, different locations and different names… it was becoming quite the effort to find them. This is going straight on my utilities USB stick.